Politician Harvey Milk ran several rigorous campaigns in San Francisco before he became the first openly gay person to be elected to public office in the United States. He preached peace through practice and understanding. He was frank and precise with his politics, namely the fail to pass Proposition 6, which would’ve fired all openly gay teachers from public schools. He was ultimately killed by fellow city supervisor Dan White, who got off on a light jail sentence for killing Milk and San Francisco mayor, George Moscone. That’s what you can get from The Times of Harvey Milk, Rob Epstein’s remarkable, Oscar-winning documentary. But in Milk, Gus Van Sant’s bold, incredible new film, you get a whole lot more. In Milk we get a more personal view of a motivated man with many faults. Milk (Sean Penn) was a failed Wall Street banker who immigrated to a free-spirited California in search of meaning. He quickly made a name for himself on San Francisco’s Castro Street, becoming known to gays and straights alike. Soon enough a business in the Castro couldn’t function successfully without Harvey’s say-so. The film continues to follow Milk through his political career, battling Prop 6 and the conservative White, while also paralleling Milk’s personal life and his inability to hold a relationship. The film, with a tight script by Dustin Lance Black (Big Love) is executed with subtle power by Van Sant. Milk has its big, climatic moments, sure, but they aren’t presented with a blazing musical score or fancy cinematography. Instead, it’s as if you are in the crowd, as another spectator. Milk plays out so accurate to real life that it’s startling. 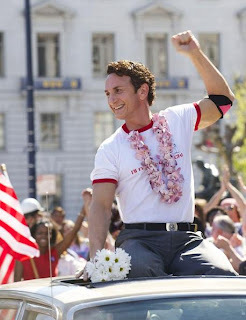 As Harvey Milk, Sean Penn gives the best performance of his career. Penn, often known for the ferioucious intensity he brings to films like Dead Man Walking, Mystic River and 21 Grams, is so remarkably subtle in Milk that we hardly know it’s him. He embodies Milk to the fullest extent. Wearing the three-piece suits, flawlessly recreating Milk’s accent and mannerisms; it is a triumphant performance, one of the best in recent memory. Penn is backed by the year’s best cast, a multitude of young actors who all deliver career bests. James Franco, as Milk’s longtime partner, and Josh Brolin as Dan White, are namely profound. They should compete against each other come Oscar time. Maybe I haven’t talked about the plot as much as I should. But plot isn’t necessary in describing this film. Milk has all the elements of classic filmmaking, those elements may not be executed in a way that’s familiar, but the film is a daring feat by any estimation.